It’s official: CBD is the hottest ticket in the wellness market. An ever expanding body of research paints a picture of cannabidiol, or CBD, as a plant extract ready to conquer an army of health issues: stress, sleeplessness, chronic pain, inflammation, anxiety and more. This legal, non-psychoactive ingredient derived from hemp has everyone’s attention, including neurosurgeon and CNN reporter Sanjay Gupta’s who has advocated for using CBD to reach a state of calm and relaxation. No wonder marketing analysts forecast CBD sales to reach upwards of $22 billion USD by 2022. CBD edibles are expected to be THE breakout nutrition trend of 2019. Sales are skyrocketing across the globe. Interest in CBD edibles spans across all adult demographics, regardless of age and gender. Research also shows significant interest in CBD edibles among Millennials who are beginning to embrace CBD-infused edibles to ease social and general anxiety, chronic pain and poor sleep quality instead of alcohol. As a generation wary of addictive prescription meds, Millennials are attracted to CBD as a natural, safe and addiction-free analgesic alternative. The New York Times declared CBD edibles to be a snack ready-made for our times. With the rise in technology, life moves at breakneck speed. CBD edibles offer the rare advantage of simultaneously calming the mind while sharpening focus. This makes them ideal afternoon pick-me-ups during that time of the day when blood sugar and dopamine levels start to dip. When you’re feeling frazzled, hungry — possibly ‘hangry’ — or just yearning to breathe easier, discreet and convenient CBD edibles are the perfect interlude. Combining powerful, all-natural CBD oil with food is a no-brainer. Edibles are easy to carry and conceal because they look like everyday snacks. While CBD vape pens could be easily mistaken for THC, edibles are much more discreet. You can slip them into your purse, gym bag or desk drawer at work. You can add CBD to almost any food, which is why edibles are turning up in gummies, honey, coffee, chocolate, baked goods and more. Each active ingredient is precisely measured, so edibles remove the guesswork of how much CBD you’re consuming. Tinctures and topicals have their benefits, however, they make it more difficult to calculate the exact amount of CBD you’re ingesting. Edibles are a powerful, long-lasting CBD delivery system. Cannabinoids in edibles are metabolized by the liver before crossing the blood-brain barrier. This results in a slower onset of effects and benefits that last longer. When added to food, CBD combines with other foods in the digestive tract, slowing the release of the compound. 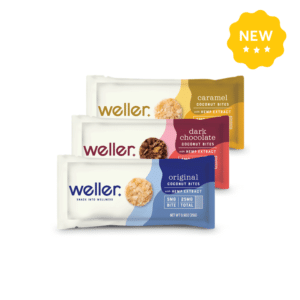 If you’re looking for a soothing and delicious CBD treat, the edibles from Weller are a tempting choice. We’re pleased to announce the addition of Weller Coconut Bites to our edibles lineup. Light yet satisfying, these Coconut Bites have a delicate tropical sweetness and a hint of saltiness for balance. Open a pack, and right away you’ll notice the deliciously toasted aroma. Weller: Coconut Bites are dairy and gluten-free, vegan and non-GMO. They come in three heavenly coconutty flavors: caramel, dark chocolate and original. But it’s really the quality and quantity of the all-sustainable ingredients that make this product stand out. These edibles are lab tested and verified for potency, so you know exactly what you’re putting into your body. Last but not least, the piece de resistance, each Weller Bite contains five milligrams of full-spectrum CBD to keep you calm, focused and confident. Call it “serenity now” in a light, wafer-sized bite. Searching for CBD edibles online can be overwhelming. Luckily, Healthy Hemp Oil has painstakingly curated a line of products containing only the highest quality ingredients. Whether you’re craving CBD-infused chocolate, gummies, honey, gum or lozenges, we carry a wide selection of calming edibles that will also satisfy your sweet tooth. Chocolate lovers should definitely consider Therapeutic CBD Chocolate Bars. Each bar boasts all the flavor of artisan chocolate, but with a potent concentration of CBD to soothe pain and calm anxiety. Another favourite to consider: Colorado Hemp’s Raw Relief Honey Chill Sticks. Made with pure, raw Rocky Mountain honey, a ten pack contains 150 mg of pure spectrum CBD. With so many choices in the growing gummies market, we suggest Tasty Hemp Oil: Hemp Oil Gummies. They’re triple tested for purity and potency and bursting with flavor. If you’re looking for a tasty way to get the relief you need, check out Weller: Coconut Bites, now available at Healthy Hemp Oil. The post Why CBD Edibles Are on the Rise appeared first on Healthy Hemp Oil.